I hope this post finds all of you enjoying your holidays and getting ready for the New Year! I had a really great time at home for Christmas, I got to spend 4 days off from work spending time with friends + family… it doesn’t get much better than that! The Bill’s season has officially come to a close (unfortunately with another year out of the playoffs) which means I now have my life back + will be posting a lot more! I had planned on holding off until after the first to start the new posts but I figured why put off until tomorrow that which you can do today?! I know, like me, a lot of you are ready to get back into a normal schedule + that includes taking a break from the over-indulgent holiday eating! It felt so good for me to get back in to the gym yesterday and I couldn’t wait for the first to get my eating back on track either. I’m going to be overloading with some clean eating recipes for the month of January so you can be on the lookout for those post. My DIY Blueprint Cleanse has been getting crazy traffic the past couple of weeks so if you’re looking for a way to detox + restart for the new year, that’s perfect way to do it! I have been making these chicken fingers for a few years now, they’re easy + cheap and SO much better for you than fried chicken fingers! Since they’re baked, the chicken inside gets nice + juicy and the outside is crispy + crunchy and has just the right amount of kick from the spices in the breadcrumbs. If you want something similar in a vegetarian option, try my Oven Fried Green Tomatoes! Preheat your oven to 350 degrees. 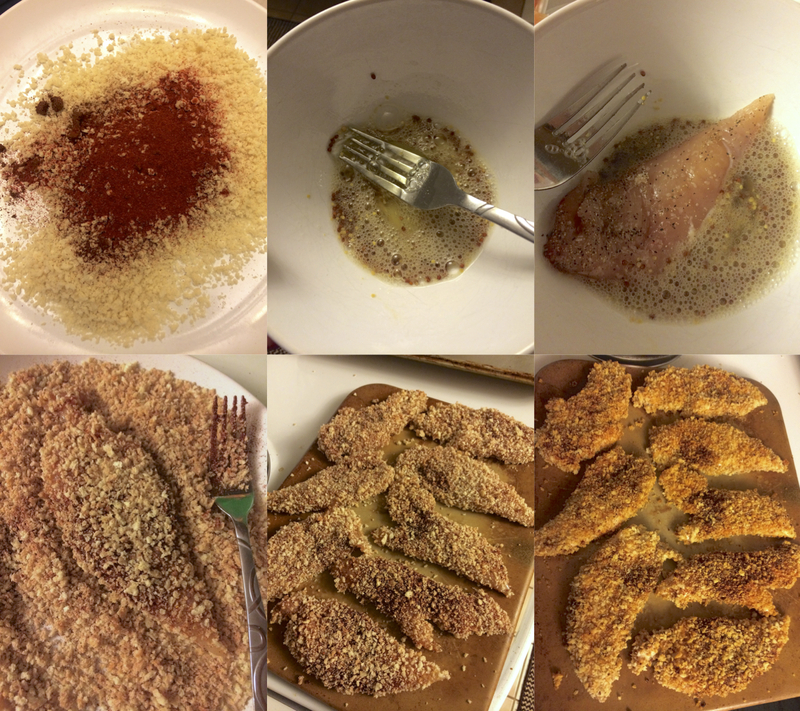 Start off by tossing 2 cups panko breadcrumbs with 1 tbsp chili powder and 1/2 tsp cayenne powder on a large plate. In a bowl, lightly beat 2 egg whites with 2 tsp whole grain dijon mustard. 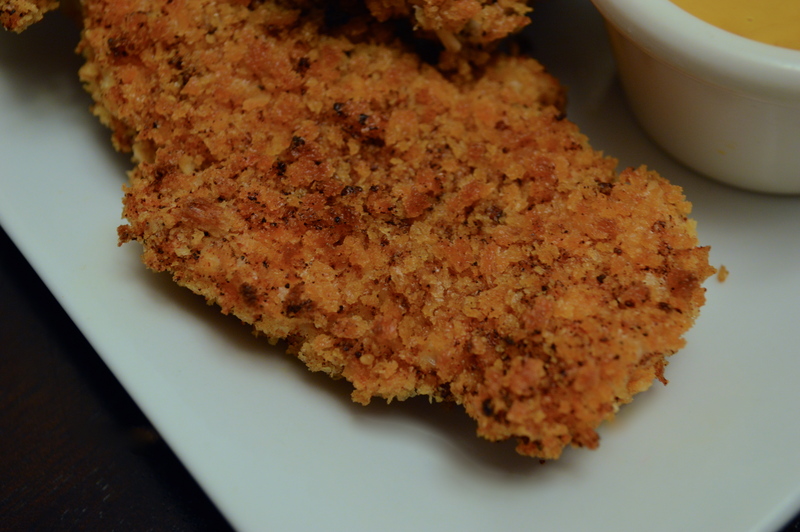 Make the chicken fingers by seasoning 8 chicken tenderloins (1 lb total) heavily with salt + pepper. Drag each one through the egg wash, then coat them in the breadcrumb mixture. Place on a baking sheet or if you have it a pizza stone … they get extra crispy this way! Generously spray each tenderloin with a fat free cooking spray. Bake for 8 minutes, flip the chicken fingers and spray other side then cook 8 minutes more! I like to make a honey mustard dipping sauce to go with the tenderloins (not included in the nutrition fast above) by combining 1/4 cup mustard with 2 tbsp honey! Preheat your oven to 350 degrees. Start off by tossing the breadcrumbs with the chili and cayenne powder on a large plate. In a bowl, lightly beat egg whites with dijon mustard. Make the chicken fingers by seasoning the tenderloins heavily with salt + pepper. Drag each one through the egg wash, then coat them in the breadcrumb mixture. Place on a baking sheet. Generously spray each tenderloin with cooking spray. 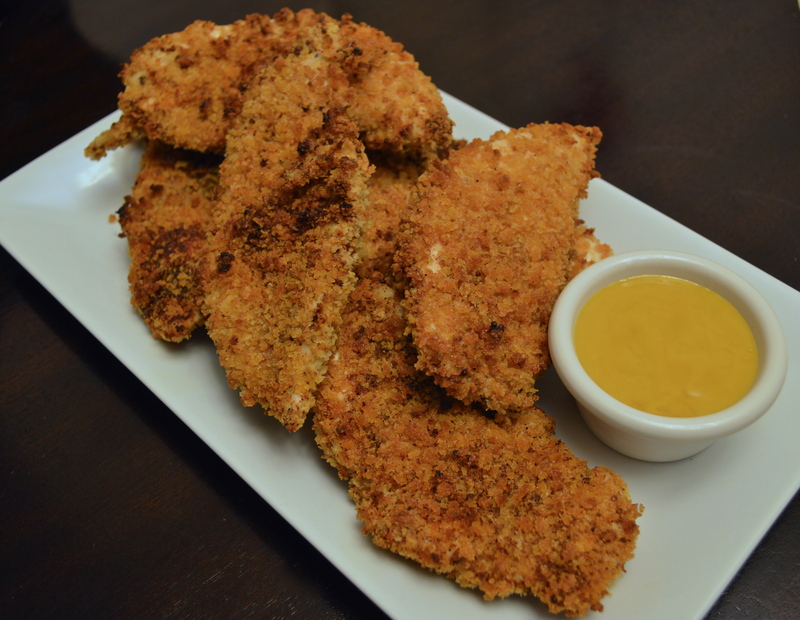 Bake for 8 minutes, flip the chicken fingers and spray other side then cook 8 minutes more! Defiantly something i will be trying, thanks for the inspiration!